If you are wondering what a Travelogue is then you will learn something new today! A Travelogue, or TL for short, is a traveling scrapbook of sorts. Members gather as a team or group and each person creates their own scrapbook (usually a mini) with whatever theme they so desire. The books travel from member to member monthly and each person adds an entry to the book following the owners specific instructions for their theme. The group I am currently in is from the Ning site known as "Your Paper Pantry," there are 6 members and we all have different themes. My theme is "inspiration". I have asked the gals to add pages which contain their favorite inspirational quotes, scriptures, poems or words that they would like to share. Phyness's TL is themed Games and puzzles. I enjoyed working on it though it felt a bit overwhelming at first. Phyness's style is much more free-form than mine and I had to let go a bit to get the results I desired. Ironically Phyness felt the same way as I did and was challenged by my theme. Working on the TL's is a great way to test your creativity! Phyness's TL is made with paper bags, since she gave us creative license I decided to use a popcorn bag I had in the kitchen, I figured snacks and games often go hand in hand! I created a pocket on the bottom, turning up at the fold and gluing down on each side. I then covered it with some chess board paper. I found an old spinner from a vintage game and cut it out with a circle cutter. I backed it with some Graphic45 paper that had little girls jumping rope . I placed various pieces from games I had around the house, score pad sheets, playing cards, etc. 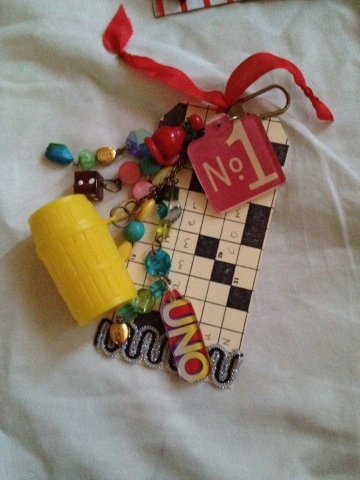 I bought t a fabulous crossword puzzle stamp and made a tag with it. On the top I added a phrase about good times and used scrabble pieces to spell out GAME being that I could not find a M I improvised with an extra W! 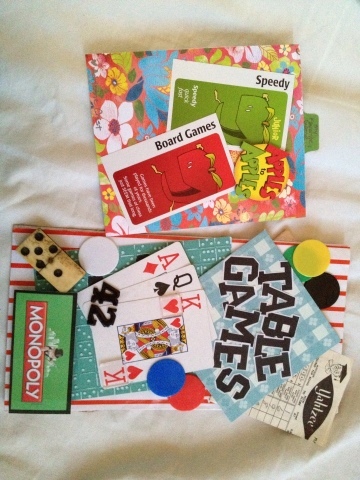 Page 2 I devoted to Table Games. The blue checkered paper was my inspiration for the title. That reminded me of a table cloth. 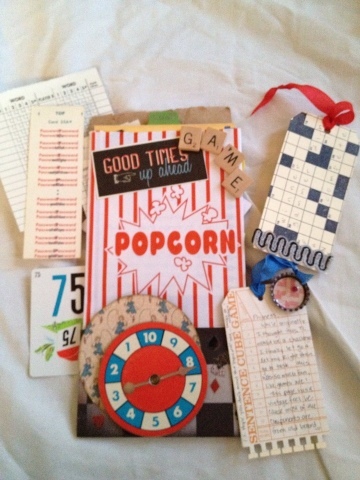 I found a Yahtzee score sheet I had to use, playing cards and a vintage Domino were added. I picked up a new Cuttlebug embossing folder with the dominos on sale at Michael's this week and put it to use. When you sand down the card stock you the white dots just pop out nicely! 42 is a domino game I played with my hubby's family a long time ago. Lastly I snagged the Monopoly from a greeting card and added the tiddlywinks for some extra color. Inside the bag I created a tag which I embellished with some colorfully Crate paper and cards from a favorite game of mine "Apples to Apples". I located the board game card which seemed perfect! This is when Scrapbooking makes me very happy! The last thing I added to the TL was a charm. I promised the gals in the group I would make them each a charm for their books and even requested they add charm pieces to my TL. I discovered a small Barrel of Monkey's game the kids never play with and used it as the inspiration for the charm. 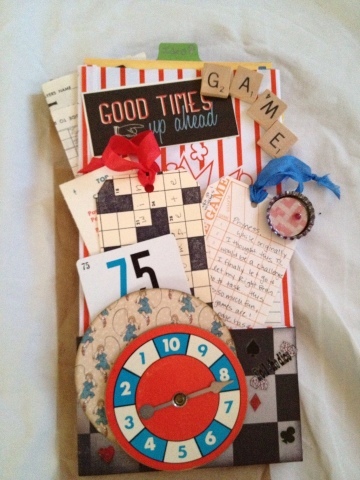 I used some Tim Holtz fragments putting #1 and UNO on each one. Pretty colorful beads and a die and now that's all she wrote!